Puttering slowly along on rural byroads in Maharashtra, engaged in a kind of mechanised perambulation, it occurred to me then that there was no finer way to traverse this land than by motorcycle. It is the mode of transport that best enables you to see and savour the wealth of difference and wonder – in geography, in human character – from one state to the next. Modern travel, with all its systems of efficiency, is often harsh to the dawdling traveller. And there is something of the dawdler in all of us – at one point or another, we have all wished to go down some enticing little road to see where it leads, or to stop and take the time to delight in a remarkable landscape. This summer, I set out from Chennai to reach Delhi, astride the most fitting of vehicles for such an endeavour: a 1984 Enfield Bullet. It was a solid and regal thing on which I had previously ridden to Hampi; at the time, as I rode through the rambling, magnificent ruins, it seemed as though I was on an iron steed equal to the stateliness of the occasion. The Bullet has long been an intrinsic part of the Indian vehicular fabric. Doing away with electronics entirely – or more accurately, never quite getting to them in the first place – it has been in continuous production for over sixty years, and remains much as it was when it first appeared. A machine built for the ages, it employs an economy of design rarely seen in the vehicles of today, with a purity of form and function that speaks to all. And then there is that blissfully singular sound; a thumping roar of power, possessed of an almost animal magic. To get the most out of an Enfield, an interest in details is a must. N.S. Seshanaath, one of the finest exponents of Enfield repair (based out of Taramani, Chennai), is adamant about the extensive care needed to properly run in and maintain a Bullet, whether new or old. And though it may seem tiresome, a Bullet is much like a living thing, in that it needs to be nurtured into its full potential. 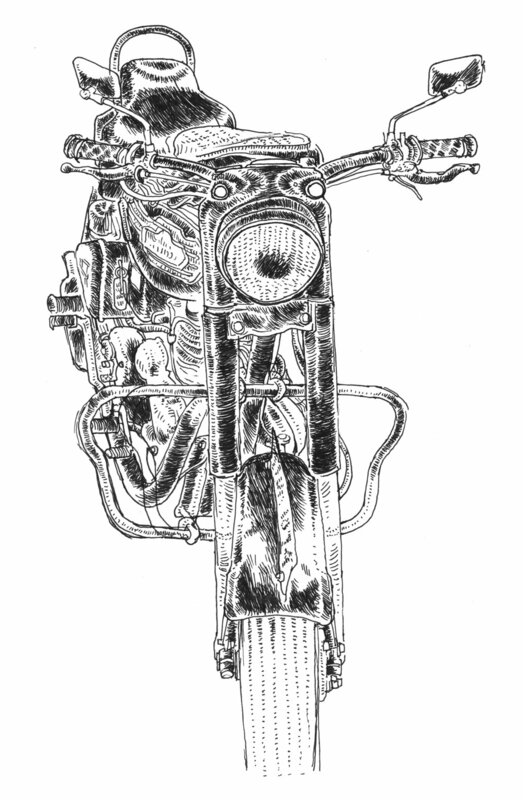 As Florian Wille – an Austrian designer who frequents the subcontinent – wryly observes, an Enfield has to be introduced to the concept of speed. But make no mistake: once this is seen to, it is a wild thing indeed. It is on the wide-open roads, stretching and winding their way through the countryside, that all falls into place. A moment of detachment arrives, where the road becomes a river, where the asphalt no longer seems rough and unforgiving, but is instead a grey and fluid thing. And here, a thing so monstrously imposing is able to lay bare its refined nature; shifting the weight of your hips ever so slightly, more a suggestion of movement than actual motion, the motorcycle responds with the graceful fluency of a dancer, moving on the road in almost liquid fashion. And on smaller, less-frequented roads a further bliss awaits; in this motion removed from all sense of urgency, achieved entirely without exertion, one is embraced by and immersed in the landscape. Once almost exclusively the province of large, often fiercely-mustachioed, middle-aged men, almost as imposing as the vehicle itself, the Bullet has seen a sea change take place in its rider demographic over the past fifteen years. There has been a welcome surge in the number of younger riders, now seen thundering about in every major city. Additionally, there is the multitude of travellers rumbling through the entire country, particularly in the areas of Himachal, Goa, and Pondicherry. Hari Saravanan, an ethnographer who uses his Enfield to do field research, also tells of young women in Bihar riding around in salwar-kameez on Bullets, lending a previously unknown and much-needed poetry to the image of motorcycling. I hear of increasingly fantastic journeys. Take Barack, a young American who had ridden down from Goa to Auroville, and spoke of eventually riding up to Nepal; or the two Dutch friends who rode their Bullets all the way from India to Holland. These stories beg the question as to what exactly the fascination with the Bullet consists of; immediately evident is the physical rush and concurrent quieting of the mind on offer. But there is also the idea of abandon, of a near-boundless freedom. And an increasing number of people have come to see it as an embodiment and direct line to a way (or rather, a dream) of life, that of the carefree traveller, beholden to none but whimsy and chance. Of course, one can argue that this is a rather illusory freedom; it requires little enough to prick this bubble of independence and self-reliance – a carburettor inexplicably spewing fuel or an ominously rattling engine will do just fine. Being wholly reliant on the welfare of an external object, it is a freedom very much tied down to luck and timing. And yet, as soon as one is back on the road, the joy returns, potent as ever. To me, the attraction is simple enough: rather than speak of being unfettered, I see it as becoming an extension of something altogether finer; to meld with iron made articulate.